Just three days ago, America's President addressed the graduating class at the US Naval Academy at Annapolis, Maryland. George Bush spoke glowingly of the progress in his "War on Terrorism." Apparently, he has no access to Internet news sources. Bush said, "We are taking the fight to the enemy abroad so we do not have to face them here at home," and received a burst of applause. He also noted that, "The best way to protect our citizens is to stay on the offensive." More applause  at least, according to the official White House transcript. Well, let me tell you a little about what's going on here at home, meanwhile, that seems to deserve such protection. Recently, high school students in Goose Creek, South Carolina received a surprise visit from the local drug task force. 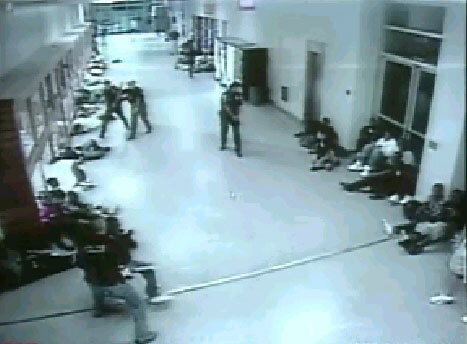 Police had been monitoring students via cameras mounted throughout the school and thought they saw suspicious conduct. 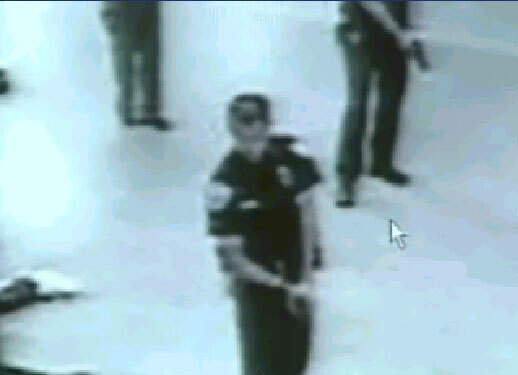 CBS News quoted Goose Creek police Lieutenant David Aarons as saying, "They know where the cameras are. If they stand directly under them, the cameras don't look directly down." Well, duh. Lack of visible proof of innocent conduct via Big Brother Cam apparently now provides probable cause to believe a crime is being committed. Did Lieutenant Aarons visit the school to peek beneath the cameras for himself? No. Did the police take it up with parents or the School Board? No. Did they search lockers? Well, yes, but only after mounting a full-on tactical-squad raid, during which students were forced to lie flat while police waved their guns threateningly and forcibly searched all kids present and all lockers. 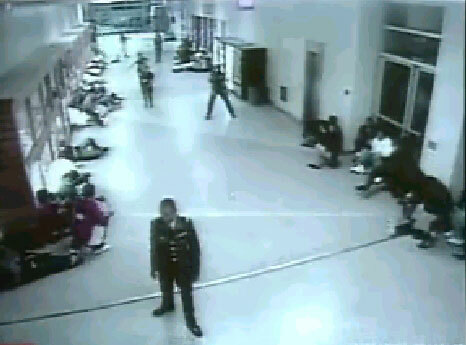 Fourteen children who didn't move quickly enough to suit the police were handcuffed and made to kneel down. No drugs ever were found, despite a phalanx of trained dogs set loose in the school's hallways. Can't you just see Colonel Klink ... er, Lieutenant Aarons ... glued to the monitors down at the squad room right now, growling and vowing to catch those criminals (our kids) in the act sooner or later? This sort of police-state tactic increasingly becomes commonplace throughout a desensitized and obedient America already manhandled and abused at airport check-in counters. What truly was remarkable about the video released to the local TV station was the obvious presence of a uniformed military officer at the South Carolina school raid, who never was identified and about whom not one word has been said in the controlled media. Ever since all those women and children were murdered in Waco, Texas by their own out-of-control government, we repeatedly have seen American military men showing up at domestic confrontations. This is the same military, by the way, that George Bush just told cheering Annapolis Naval Academy graduates is "taking the fight to the enemy abroad so we don't have to face them here at home." Indeed. "The best way to protect our citizens is to stay on the offensive," said Mr. Bush, don't forget. Well, he certainly is being offensive ... in every sense of the word. Meanwhile, back in the halls of America's Congress, US House Judiciary Committee Chairman James Sensenbrenner (R-Wisc) wants to force every American to become an informant by making it a jailable offense not to rat out others  even other family members. Congressman Sensenbrenner has introduced HR 1528, which itself asks to be cited as the "Safe Access to Drug Treatment and Child Protection Act of 2005." Tough to argue with a bill carrying a title like that, eh? Well, here's what that bill requires: if you learn about drug offenses, you must report them within 24 hours and provide "full assistance in the investigation, apprehension and prosecution" of those involved. So, if you find a joint in your son's sock drawer, you'll have to call the police. Or, if you overhear your daughter ask a friend in rehab to get her an Ecstasy tablet for an upcoming rave party, HR 1528 says that you go to jail if you don't report her to the police right then and there. What's more, HR 1528 mandates 5-year prison terms for a great many new offenses, including offering a joint to, or asking for a controlled substance from, anybody who ever has been in drug treatment. Ten years for parents with "substance abuse problems" who commit certain drug-related offenses at home  even if they are alone at the time. The only thing that America's much-ballyhooed "War on Drugs" ever has done is create more drug criminals and prison inmates, usually out of otherwise solid, law-abiding citizens. Similarly, all that America's "War on Terror" is doing is creating more terrorists. It may have been safe for Americans to travel abroad before, but it certainly isn't safe today. Nor will it be tomorrow. And the mentality has seeped all through society, as exemplified by so many recent and outlandish police interventions in America's public schools. And the police seem to be in league with the military, at that. As if America, who leads the world both now and throughout all of history in the percentage of population behind bars, needs to make criminals out of still more of her good citizens. Shortly after 9/11, George Bush told us that Arabs armed with box cutters and no flying experience commandeered three jumbo jets and flew them with air-show precision into three buildings ... because "they hate our freedom." Well, he was partially correct. Those responsible for 9/11 and other atrocities, both here and abroad, do hate our freedom. And we do need to be afraid of them. Problem is, they are us  our own government, actually. Otherwise, why would our own government be taking away our freedoms at such a rapid pace? Why are they so afraid of us and in such a hurry to regiment us, lock us down and throw so many of us into jail? What is going to happen that they need such tight control of us? What, exactly, is it that they plan next to do to us? We have nobody to blame but ourselves. We may not have elected them, such a sham has America's electoral process become, but we allow them to continue to rule over us. An earlier America would have seen such "leaders" tarred, feathered and ridden out of town on a rail. A more responsible population today spontaneously would form leaderless mobs and drag them from their plush Capitol Hill and Wall Street offices, to languish in the prison cells to which they consign our fellow citizens for the slightest offense ... and worse. Osama bin Laden, in one of his earliest communiqués, justified the targeting of ordinary American citizens by pointing out that we have both the responsibility and the collective ability to replace our leaders, yet we do nothing while they plunder the world in our name. He was right. What's more, Pogo was right when Walt Kelly used him to say that "We have met the enemy and he is us." Chicken Little was right, too. Like Winston Smith, George Orwell's leading character from his masterpiece, 1984, Pogo and Chicken Little were characters years ahead of their time. Their time now has come, sad to say. But, then, so has New America's. Permission is granted to circulate among private individuals and groups, post on all Internet sites and publish in full in all not-for-profit publications. Contact author for all other rights, which are reserved. Edgar J. Steele, noted civil-rights attorney, is the author of Defensive Racism - An Unapologetic Examination of Racial Differences. This article originally appeared on his website at http://www.conspiracypenpal.com/.